Almost done with the Low Mids for the system. Interesting design choice! 15's are they? Any reason not to choose 12's? Seems like a very short horn for kick. 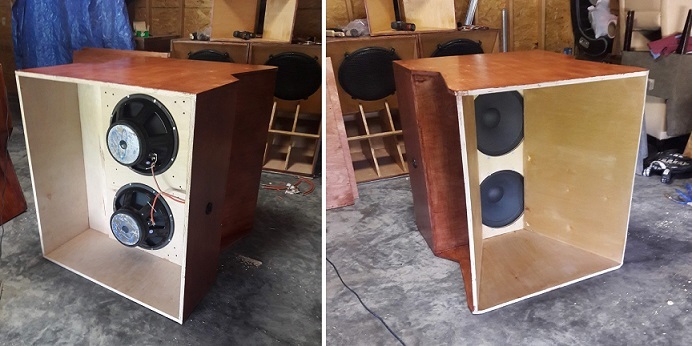 The cabinet finish resembles the era when horn loaded loudspeakers were common homes. sorry for the late replies. These are designed after the Altec 817's they are going under 2-12s and a horn each side of the stage and the hogs will be center. They are 15's. I wanted something between the 12's and hogs. And yes retro was kind of the goal on the finish, they wont be used but a few times a year so covering up scratches from loading wont be that bad..